Board of Intermediate and Secondary Education Lahore managed the annual exams of matric and inter classes at the particular time every year. The regular and private students of matric part 1 and 2 and FA/FSc part 1 and 2 appear in the annual exams. At the intermediate level, there is diversity of the groups like FA/FSc, I.Com, HSSC Part 1 and 2 and ICS and students apply for their respective class. 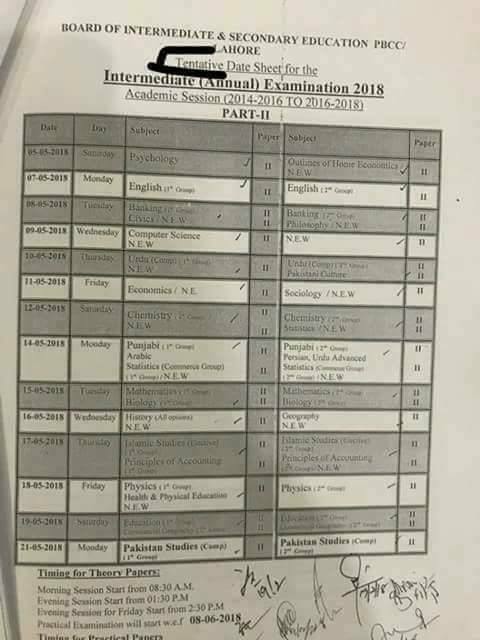 Before the commencement of the annual exams, BISE Lahore Board issued the date sheets of the students to mention their exams centers and roll number slips to the students. The students should visit this page regularly so that they can get the date sheet of their annual exams from here.